Make a sunny room fit for your baby to sleep soundly. Velcro fastening is easy to use and quick to adjust. Gently press a corner suction cup on to window. For a tall window begin in the top right corner. For a wide window begin in the top left corner. Work across the window pressing cups on to glass. Adjust width using velcro patches. If a sucker will not attach, check glass is clean and moisten slightly. Work down both sides and finally along the bottom. Occasionally, suction cups become deformed in transit which may result in them not sticking effectively to the window. Simply roll between fingers or place in warm water for 30 seconds to restore their normal shape. Do not grab blind and pull. This risks serious damage to the window glass. Remove each suction cup one at a time. Use the small tab on each one or your finger nail to release. 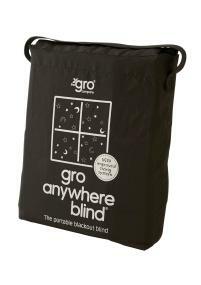 The blind can be safely applied to normal single or double glazed windows in good condition. Do not use on windows that have damaged edges, visible chips, cracks or any other glass or frame damage. Do not use on laminated, textured/patterned or leaded glass or windows with internal wire strengthening. Comes with handy travel bag. "Easy to adjust for varying windows, didn’t take long to put up at all! Blocks out most light, we will be using this at home too, hoping it will help our girls sleep better in the lighter months!! Would definitely recommend." Leachco Safer Bather Infant Bath Pad Safer Bather bath pad has all of the features every parent needs to assure baby's bath is as safe and pleasurable as can be. The head is elevated keeping water out of baby's ears, and it won't break or pull apart like some sponge pads. Soft polyester filling dries quickly with a sturdy hanger for convenient drip dry storage. Baby will appreciate not having to lay in a hard plastic tub. Safer Bather can be used to sponge bathe newborns or place directly into the full size tub when your infant is ready to make the transition. Just fill the tub and place Safer Bather directly in the tub. It is constructed of an open weave polyester fabric that is soft and porous, made just for the bath. The inner polyester batting conforms to baby's body creating a soft cushioned pad like no other. When fininshed, just shake out the pad and watch the water quickly escape. 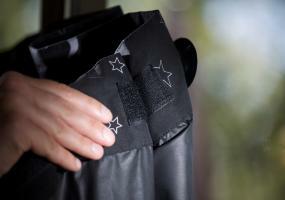 The fabric's special weave design actually speeds up water loss. Splish-splash, who's takin' a bath? Baby is - in this perfectly pink, four-stage bath center that adapts to parents' and baby's changing needs. Newborn sling, baby-stopper insert and Sit-Me-Up Support each lend a "helping hand" to keep baby from slipping and sliding in the tub. Keep the splashes coming with a handy rinse bottle and whale scoop toy. Stage 1: Soft mesh sling for newborns, Stage 2: "Baby stopper" insert prevents slipping & sliding, Stage 3: Sit-Me-Up Support aids unsteady sitters, Stage 4: Roomy toddler tub. Sometimes it's tough to keep everything squeaky clean, and contained, during baby's bath time. That's why Munchkin created the Clean Cradle Tub. Designed to work directly on the counter or in the bathtub, this portable infant bather features high side walls and non-slip feet to help keep wiggly babies in place. An ultra-soft inclined basin provides full head and body support, keeping water out of baby's ears. The stable, non-slip design keeps your precious bather cradled in comfort while giving you complete peace of mind. And a removable front drain plug allows dirty water to flow out as fresh water pours in. This baby bathtub even separates into two parts to make cleaning both quick and relatively painless. Finally, bath time equals comfy time for baby, and you! Recommended for use with babies 0-6 months old. GoodNites Bedtime Bedwetting Underwear for Girls provide outstanding nighttime protection for kids who are daytime trained, but still wet at night. Our disposable bedwetting pants provide 5 Layer Protection and Double Leg Barriers to help absorb and lock away wetness with 40% more protection vs. the leading training pant. GoodNites Bedtime Pants also feature extra protection where Girls need it most, and fun Disney designs she'll love. Plus, they are odor absorbing for more discretion, while the super stretchy sides provide a better fit for many body shapes and sizes. GoodNites Bedtime Underwear for Girls are now available in three sizes: Extra Small for Girls 28-45 lbs, Small-Medium for Girls 38-65 lbs and Large-Extra Large for Girls 60-125+ lbs. Don't forget to Subscribe & Save to make sure you always have GoodNites Bedtime Underwear for Girls delivered right to your door. The Summer Infant Bath Sling with Warming Wings keeps baby warm and comfortable during bath time. Detachable warming wings can be used wet or dry. The sturdy base keeps baby secure and the built in headrest keeps them cradled and supported. Pampers Easy Ups are the easiest way to underwear! Pampers Easy Ups Training Underwear have a 360° stretchy waistband that moves with your toddler, giving him a fit that's just like real underwear. The elastic waistband helps him to pull up his Easy Ups with ease, like a big boy. They also tear easily at the side seams for easy removal, just in case! Easy Ups are super soft, like cotton underwear, to keep him comfortable, while the Dual LeakGuard Barriers will keep him confident—helping prevent the leaks that can happen when he moves. Plus, Pampers Easy Ups are the only training pants with Extra Absorb Channels to give him the outstanding Pampers Leak Protection he needs during the day AND night. A collection of Thomas the Tank Engine designs will help make potty training fun! Pampers Easy Ups: he'll think it's underwear. You'll know it's Pampers.